Lars Calliou Presents The Road Warriors Comedy Tour 2013 is Now Underway ! 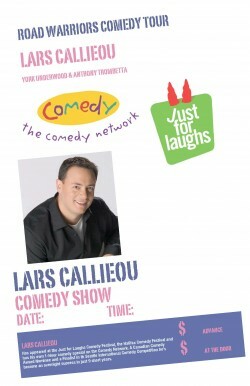 Lars along with his fiends, -York Underwood -Tony Trombetta Bring You a Great Night of Comedy ! Currently Taking Dates in Northern Alberta and BC ! Bio: Lars has done almost all there is to do in Canada. He has a comedy special currently airing on the Comedy Network, appearances at the Just for Laughs and Halifax Comedy Festivals and his comedy radio show was nominated for a 2011 Canadian Comedy Award. He's been on CBC's The Debaters, XM Radio and Shaw Cable. In America Lars was a Finalist in the Seattle International Comedy Competition, he's traveled to IRAQ and Kuwait TWICE to entertain the service men and women and he's appeared at the Bridgetown Comedy Festival in Portland, Boston Comedy Festival and at the end of last year he toured with Miss Joan Rivers for a second time. She even requested him personally, "Get the funny Canadian kid again." He's become an overnight success in just 9 short years.